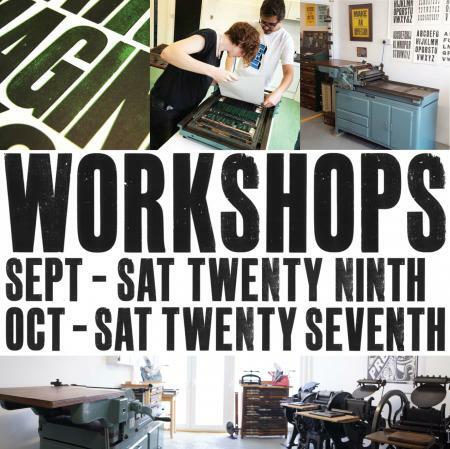 Workshops offer a unique hands–on experience of Letterpress printing using my vintage wood block poster type collection, during the workshop you will learn how to hand ink and pull prints using a fully reconditioned Vandercook 4C “The Brit” printing press and a George Pallister & Sons table top proofing press. Spaces are £50 per person, max group size is 4 all materials are provided as is tea and coffee. Workshops start at 10.30am and run for around 3 hours, all participants will leave a collection of poster prints. We are located 2 min walk from Bognor Regis Train Station, there is plenty of car parking options and it is a 5 min walk to the beach! I also run one two one sessions, and larger group workshops please email me for further information.